I don't know about you but music really gets me moving. As soon as I hear one of my favorite songs I just want to get up and dance. Have you noticed that when you are listening to music you work harder and faster when you hear a song that is more fast paced? 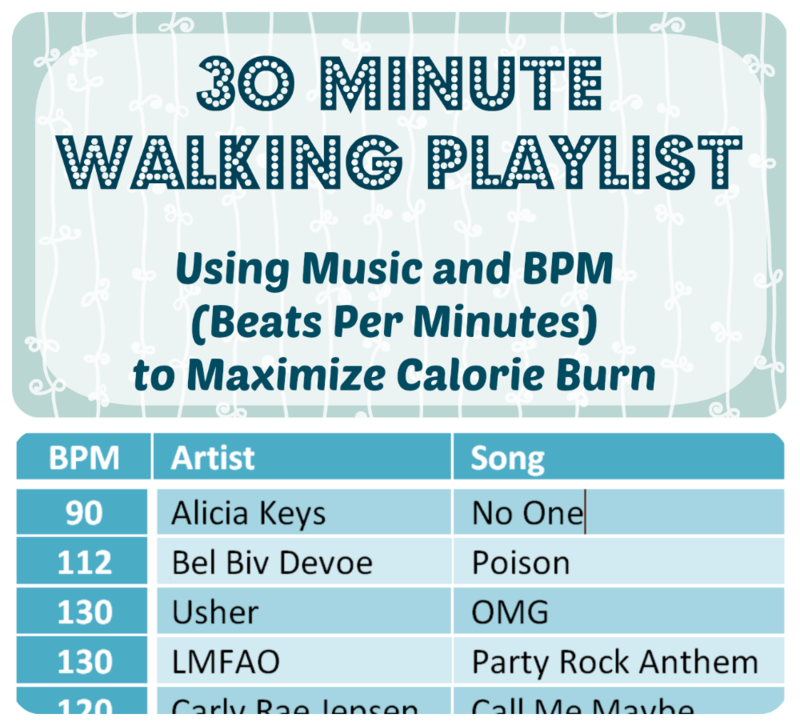 Each song has it's own BMP or Beat's Per Minute which can help you keep up with the pace of your exercise. You want a slower paced BMP for warm ups and cool down's and a faster BMP for working out and sprints. A song with a steady BMP can also help with your endurance. I wanted to go for a walk today so I did some research on some walking playlists with BMPs listed. There were some great playlists out there that listed BPM (Beats Per Minutes) but there wasn't a full playlist that had all of the songs I liked. I tend to move faster when it is a song I really like and know the words to. I wanted to create my own walking playlist so I researched some more and found http://walk.jog.fm/ This site allows you to search songs by name, artist, genre and BPM's. Search a song and the BPM's is listed right there with it. This is the playlist I came up with. What songs keep you motivated to move? Usher can always get me moving! both of these playlists are GREAT! I love upbeat music when I workout! Robin Thicke is great! Music gets me going as well. I love cranking it up when cleaning and working out. Nice playlist. You have a variation from 60 bpm to a faster 130. I also like Titanium and Blurred lines. Maybe you want to add Get lucky of Daft Punk. What a great idea! I love anything by the Black Eyed Peas. They always have really good beats. Thats a different mix of few different kind of music.. mine mixes every era.. I agree that music gets me moving too. And it tends to be more fun! That's a real nice mix. I agree about the beat effecting my effort, whenever I run I match up my stride with whatever song is playing. It's probably not too healthy of a practice, but as long as I get through it I'm happy. This is a great Idea! You are absolutely right, a good song always gets me moving!! Music is key! Anything rock and roll is for me or fast moving pop. When I want to slow it down I change it to country. I am so bored with my workout list this is a great list. 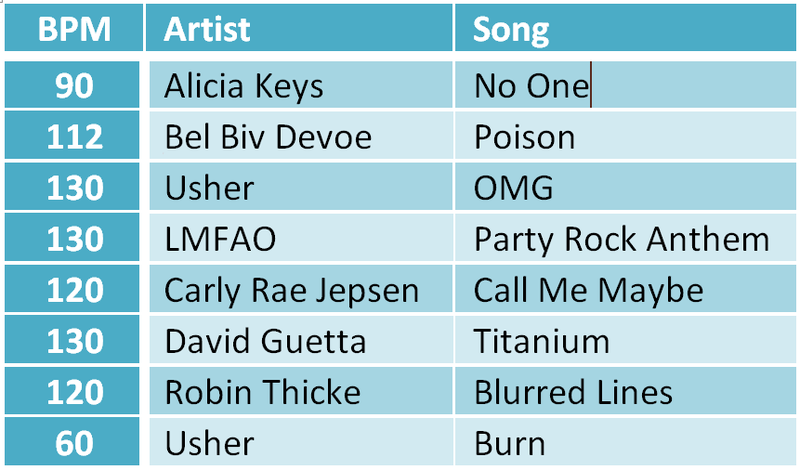 This is a great list of song to work out too. 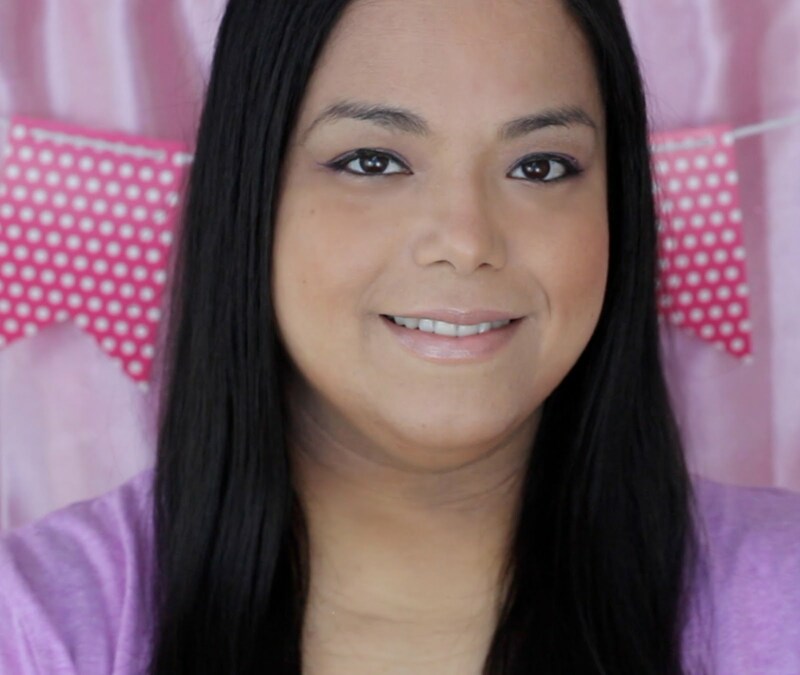 I havent really done any exercise lately but i will have too soon! Thank u for sharing! Those songs have great beats with them. I can see why they'd be motivating for movement! I got no where to walk around here, I miss living where there was sidewalks, It's not safe to walk out here in the country, drivers are crazy. But I do love this playlist. I have never walked and listened to music. I love walking and it can keep you in shape also. Great play list and thanks for sharing. Music gets me moving as well, I love your playlist. Great selection! I never thought of looking at beats per minute. Listening to really poppy songs that I normally don't listen to really gets me going faster on the treadmill! We go walking as a family when its not so hot outside, it's a great bonding experience. Thanks for the playlist!